The ultimate gift for any time of the year. 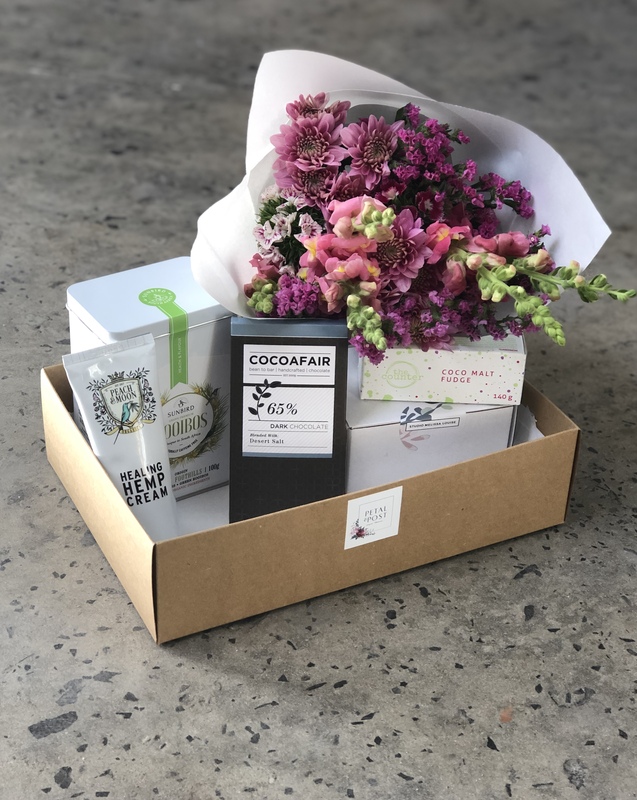 Box includes a famous, fresh Petal&Post Posy, along with our select set of gifts proven to wow any loved one! – Sunbird Rooibos tea: Local terroir Rooibos tea straight from the mountains of the Cederberg. – Melissa Louise Candle (Ylang Ylang) Studio Melissa Louise, a creative studio based in Cape Town, mix and hand pour vegan candles for your home. – Cocoafair chocolate (desert salt) Bean to Bar Handcrafted Chocolate. Made in Cape Town. Available for Tuesday deliveries only.